After a long time dormant, I decided to return to this painting, to work on it to completion. 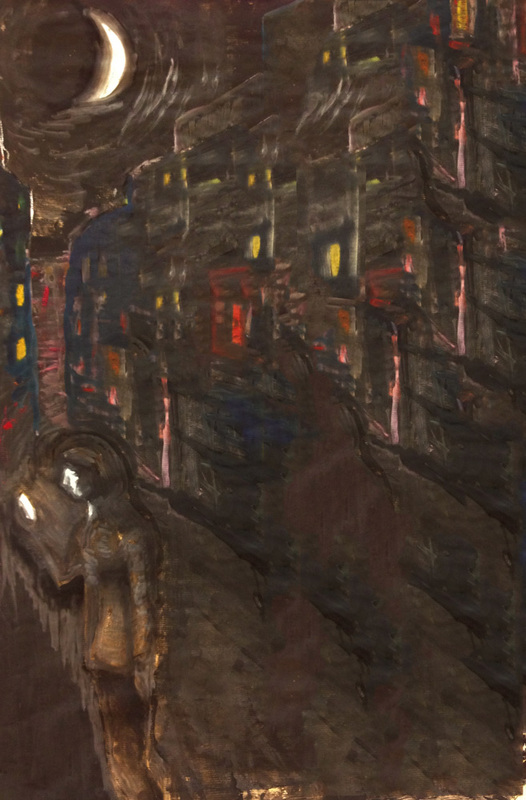 I have some studies for the foreground figures, an idea of where I would like it to go next. However, I showed it to an artist friend of mine and they said they liked it as it is. They consider it complete, in fact. I hate my stupid face. And I love it, and I hate it. What is a self portrait: An act of vanity, fantasy, of self-loathing? All? None? How can we even paint ourselves when we don’t even see ourselves as others do? Or how can we represent ourselves when so much of our selves is unknown to us? – the subconscious, the denied. How do we represent what we substantially are, in a superficial world? There are no answers entire offered here but those are some of the questions I’ve asked in between swearing and silence. I began this self-portrait ages ago. I painted a relatively realistic rendering of my face, then I painted over it a grotesque charicature, then I painted over this a beautified version. 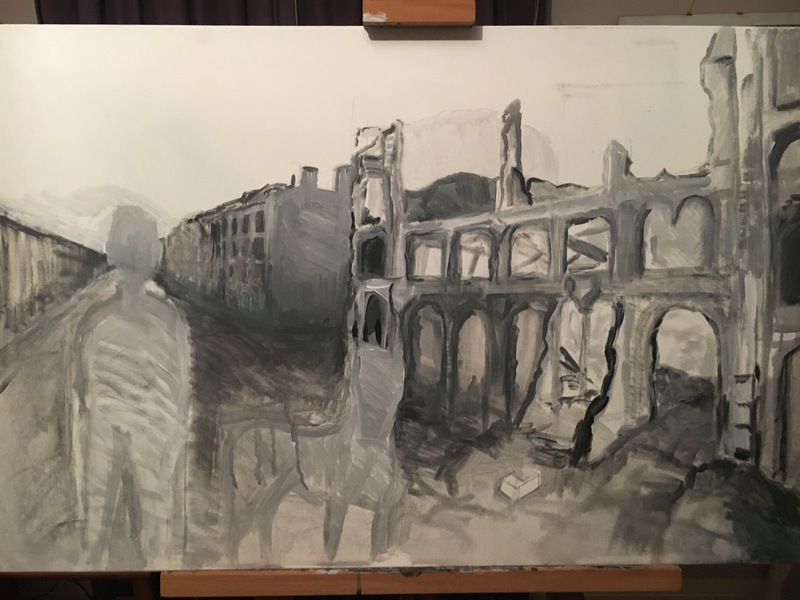 I’ve now returned to it, and using ‘dramatic’ upwards lighting created a layer over this tending towards the grotesque and the realistic at once in an attempt to balance all three versions in one. I’m not happy with it, but then neither am I happy with my face. Acceptance is the order of the day. A still life of a femur, an iPhone and plastic flowers in a jar of water. Work in progress. I like bones as organic objects and symbols of mortality, and I like also the contemplation of man’s place in the scheme of things, which he decorates with all manner of fanciful conceits. The supposed dominance of nature, while still at mercy of her whims. The plastic flowers are perhaps a symbol of this. In Kubrick’s Space Odyssey he illustrates the key-point evolution of man from ape through the use of a bone as a murderous tool: Thrown into the air it transforms into a space ship, another great evolutionary leap. These leaps are marked by enigmatic slabs – markers or beacons, it is never explicitly explained – they appear to be the work of an overseeing alien intelligence. In this still life the iPhone and bone allude to this. 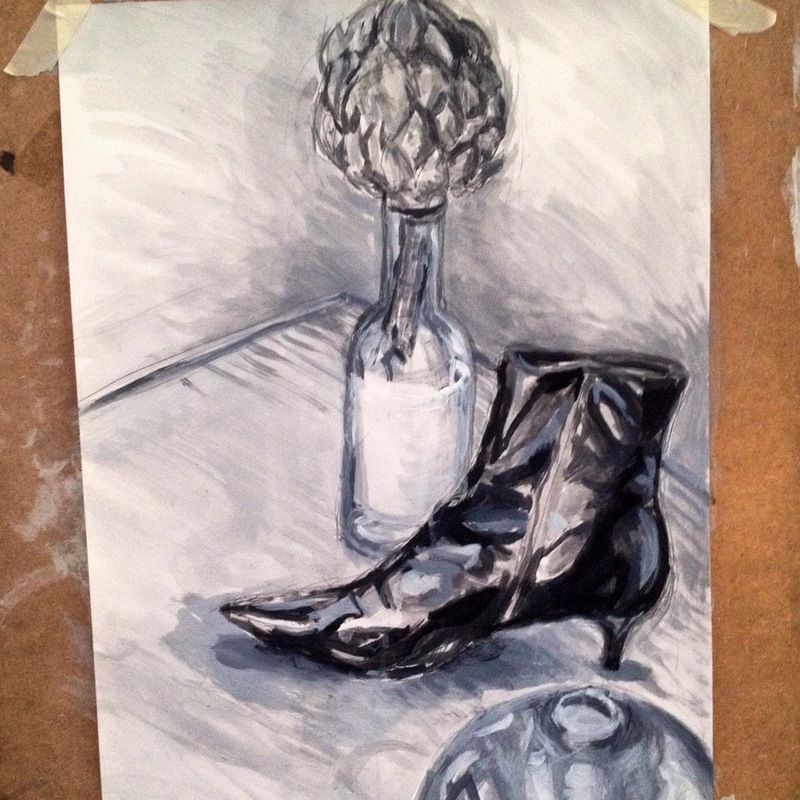 Just a little still life sketch in acrylic, of a shiny boot, vase, bottle and dried artichoke. This is a large (approx 4ft squared) study in acrylic, I wanted to play with visual language. Last summer I was walking on the banks of the Thames, when I chanced upon a bone. It was small and old looking and, while I was curious about where, what…and for second even whom it had come from, I shrugged and pocketed it along with some water smoothed glass. 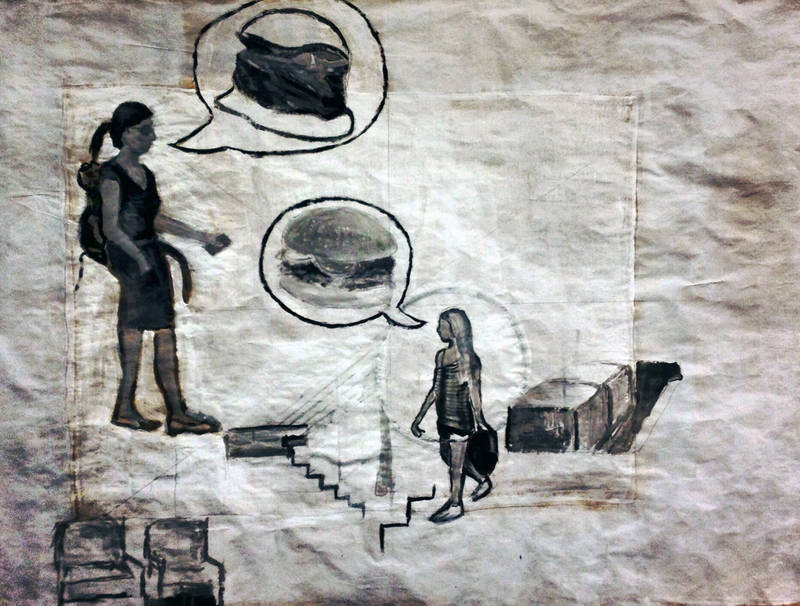 I’ve been working on a large painting that features a burger, so I started to make a large study of one – but it struck me that pairing up the burger with this object would provide a telling portrait of both. They are both objects of death, after all.